Clint Enns is a filmmaker located in Winnipeg, Manitoba whose work I was just introduced to. While he’s made a wide variety of different experimental films, I’ve decided to focus this post on his two disaster-themed works that I’ve watched. The above embedded video is the death of natural language. the death of natural language is animation of a plane crashing using just ASCII code. For the non-computer literate — and I had to look this up myself — ASCII is an acronym for American Standard Code for Information Interchange, a computer coding standard based on the ordering of the English alphabet. 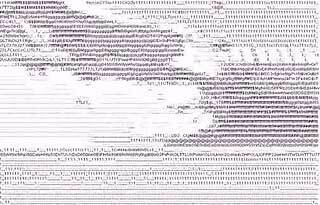 In Enns’ video, the vague shape of the aircraft flying and some images from within the cockpit and cabin can be seen soaring through a field of ASCII characters, giving the feel of a plane flying through a thick fog. The abstracted crash blast is more difficult to make out, miming the chaos an actual event of this type would incur. The accompanying music on the soundtrack, the song “Miko” by the band The Beans, is appropriately slow and haunting, which emphases the slow-motion of the animated crash. Again, an actual crash would happen in the blink of an eye, but Enns stretches it out. The almost-three-minute film feels much longer, expanding the agony and sadness. What’s especially intriguing is that while seeming very simple — it’s just some code made out of letters — the animation process must have been terribly complex to build it frame by frame out of that code. Both the technical and the emotional aspects of the film is exceptionally complex. The other video I’m embedding below is windshield baby gameboy movie, which takes video of a car crash and processes it through a Nintendo Gameboy camera, a device I’m not familiar with. It’s a highly pixelated film and much more abstract than the death of natural language. There’s no music on the soundtrack, just short random bursts of classic video game blips so that the horrific sound of screaming metal and glass shattering is reduced to that Atari Pac-Man sound you still hear today whenever somebody’s playing a video game in a movie. Enns has several videos up on Vimeo that I heartily recommend watching, especially the beautiful winnipeg stories: sacrificial memories. Also, Enns has had his films screened at several festivals I report on, such as the Florida Experimental Film/Video Festival, the Antimatter Underground Film Festival, and in his home city, the WNDX Festival of Film & Video Art.